I made these for Christmas gifts this year, and they were so good! Have a stand mixer handy & start with a very clean mixer bowl. In a medium sized heat safe bowl – soak gelatin in 1/2 of the water, give a quick stir. Let sit for about 10 minutes until it has bloomed & thickened. Prepare pan – spray a 9×13 inch baking dish with canola spray. Sift some powdered sugar on the bottom & edges. Crush candy canes in food processor until a fine powder is achieved. Add powdered sugar & mix again. Transfer to a covered container & set aside. Whip the egg whites to stiff peaks in stand mixer. Transfer to another bowl & put in the fridge while the sugar syrup reaches the correct temperature. Clean the mixer bowl. Add water, sugar & corn syrup to a medium saucepan. Stir until just dissolved over low heat. Raise the temperature to medium high heat until the mixture reaches 240˚F. (not longer) Keep a candy thermometer in the pan to properly gauge temperature. If there are any sugar crystals at the edge of the pan swipe with a damp brush. This mixture will boil for about 12 minutes before it reaches the proper temperature. Put bloomed gelatin in mixer bowl, stir in hot sugar mixture until gelatin dissolves. Start on low speed to mix then mix at high speed for about 6 minutes until mixture is white, creamy & has tripled in volume. Add egg whites, vanilla & peppermint. Beat until just combined. Spray a spatula with cooking spray & gently scoop the marshmallow mix into the prepared pan. 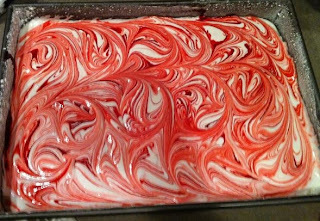 Add dots of bright red food coloring to the top of the marshmallow mix & swirl in with a skinny knife or chopstick. Flatten the top with oiled spatula if desired. Sift 1/4 cup of the candy cane powdered sugar over the top of the marshmallows. Let sit for at least 3 hours to overnight. Sprinkle some candy cane powdered sugar on a cutting board. Gently run a knife around the edges of the marshmallow pan to loosen it. Carefully flip the pan onto the cutting board, loosening the marshmallows with your fingers until it releases & drops down. Spray a pizza cutter or sharp knife with cooking spray & cut marshmallows into desired shapes and sizes. Coat marshmallows with candy cane powdered sugar. Not a fan of peppermint? Add another flavored extract. Coconut, orange, coffee, cinnamon, chocolate, etc would all make great marshmallow flavors. Store marshmallows at a cool room temperature in an airtight container for about one weeks. Layer hot cocoa mix, chocolate chips and marshmallows in a mason jar. Tie with ribbon of your choice and a candy cane.